Twenty-five years ago an earthquake in California’s Bay Area stopped the World Series, killed 63 people, collapsed freeways and caused billions in damages. But according to a new report, on the 25th anniversary of the Oct. 17, 1989, Loma Prieta earthquake, only 10 percent of California’s 7 million plus homeowners have earthquake insurance – and the number has dropped by more than half since the deadly quake. Seismologists say California is due for another major earthquake within decades –- just this week, they released a study that said stress is building along several Bay Area faults — and the lack of insurance carries with it the risk of catastrophic losses for homeowners and for the U.S. economy. Why do so few people in the nation’s most earthquake-prone state have insurance? NBC News asked insurance, real estate and risk experts for their insights, and found a list of seven fairly shaky reasons. You Mean I’m Not Covered? Starting in 1985, California law required insurers who wrote homeowners’ insurance to also offer earthquake coverage policies. At first, the premiums were affordable, say experts. The number of insured Californians rose, and had reached 20 percent at the time of the Loma Prieta quake. Then the Northridge earthquake of 1994 hit the San Fernando Valley north of L.A. Insurers were swamped with 300,000 residential claims totaling $12 billion. Some stopped offering earthquake insurance and others raised the premiums exponentially. In response, the California Legislature created the CEA to guarantee that coverage was available to homeowners. But homeowners weren’t — and still aren’t — required to buy earthquake insurance. The percentage of insured homeowners, which had continued rising after the Loma Prieta quake and topped 30 percent, dropped after Northridge. Premiums for earthquake insurance range from $800 to $5,000 annually, and deductibles are typically 15 percent of the total value of the home. California houses aren’t cheap –- the current median sale price is just under $400,000, and is higher in many of the counties most at risk. For a $400,000 home, the deductible would be $60,000. For people of moderate income, that monthly pricetag can seem like a luxury. People of greater means have a different version of sticker shock. They often opt not to buy the insurance even though they can handle the price. Anecdotally, state officials say they have heard instances in which professionals –- estate planners, insurance and real estate agents and financial advisers – have discouraged clients from buying earthquake insurance after calculating the risk vs. the reward. Pomeroy said the CEA is seeking changes that would give homeowners more of these options, including a range of deductibles from 5 to 25 percent. The goal is to offer a similar range of deductibles for personal property protection. “We are trying to move from a one-size-fits all approach to allowing consumers to choose the types of coverages that most meet their needs,” Pomeroy said. Two decades is a long time, especially in California. In the Bay Area and greater Los Angeles, much of the population is made up of immigrants, young people and transplants from elsewhere in the U.S. They have no personal experience with any earthquake as devastating as Northridge or Loma Prieta. 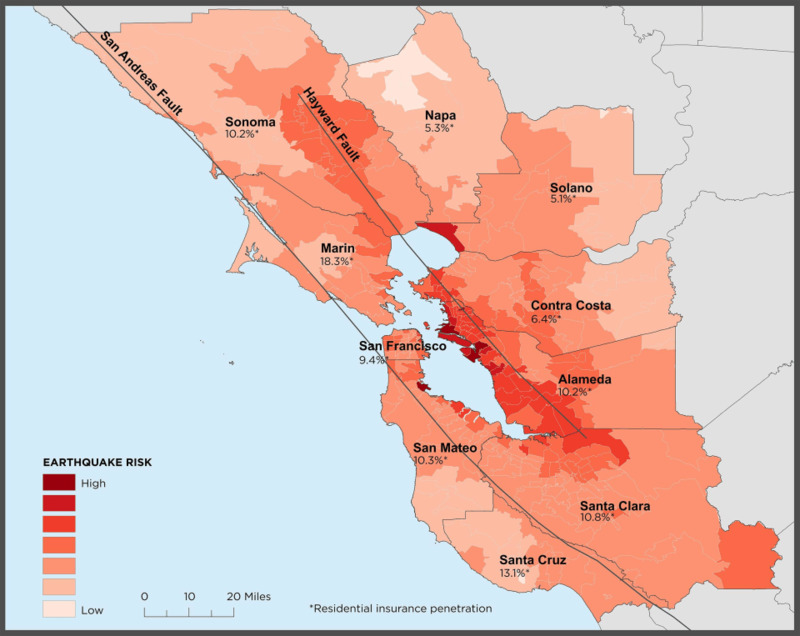 This map shows risk of a 6.7 magnitude earthquake or greater striking over the next 30 years, along with percentage of homeowners who carry earthquake insurance. In August, the Bay Area suffered its strongest quake since Loma Prieta. A 6.0 magnitude temblor centered in southern Napa County killed one person and caused $400 million in damage. Sixty-four miles south, in San Jose, insurance agent Chuck Nielsen said, “Our phone didn’t ring.” Nobody even asked about earthquake insurance, though people throughout the Bay Area could feel the ground shake. Some homeowners, according to experts, have apparently decided that should the high-impact event really occur, they don’t need insurance because they have a sugar daddy. They think they’ll be covered by the federal government. While the president would likely declare a federal emergency after a major earthquake, assistance to individuals and households is only intended to get people back into their homes. FEMA’s emergency grants for homeowners are capped at $32,000, and most home rebuilding aid comes in the form of loans administered by the Small Business Administration (SBA). Eligibility for the SBA loans is typically triggered by about $40,000 in personal property losses and $200,000 in real estate losses. Applicants should remember, however, that the loans won’t lower their existing mortgage payments by a penny.